The Downstream Cup Final game featured the two ball clubs from Chattanooga, who were both victorious in early day action. Lightfoot jumped out to an early 3-0 lead and the rest of the game would be a chess match between both clubs. Each ace was precious and hard fought. By the third frame, the score was tied and both teams would swap the lead numerous times. At the end of 9 innings the match was all square at 6 after Bandit scored an ace in a close play at the dish. It was the bottom of the 10th inning that saw Lightfoot score the game winning run after Mac scored from first on a great right field strike by H I. This was the first win by the Lightfoot Club over MC and it came at an opportune time for them because it yielded the coveted Downstream Cup. At the dish for MC, Sweet Feet and Red Bird both went 3-3. Edmo and Bandit anchored the infield, while Taco, Sweet Feet and Britches all made great plays in the garden. MC would like to extend a big huzzah to their Chattanooga brothers for their well deserved victory. God was smiling down on the good folks of Chattanooga and Fort Oglethorpe because the day was blessed with beautiful weather and amazing base ball. The 3rd game of the season was also the 2nd game of the Downstream Cup, which featured the Emmett Machinists of Knoxville vs the Mountain City Club of Chattanooga. MC jumped out to an early lead and put the spurs to the stallion the rest of the match. The score was 5-0 MC, after 2 innings, and the 3rd inning featured 7 aces for MC. At the close of the match the final score was 18-0 MC over the Machinists. At the dish, Britches went 4-4 and scored 4 aces! Taco and Red Bird both went 3-4. In the field, the Mountain City Defense was stellar again, causing a shut out game. Edmo was a consistent force at 1st sack, while Sweet Feet and Taco owned the garden. After 3 matches, 27 innings played, MC has outscored opponents, 47-5. The MC defense has caused 24 scoreless innings out of the 27 innings played this season. OB played a great all around game, getting 2 RBI’s and showing tons of ginger in the field. This performance earned him the game ball. It was a beautiful day for base ball with the skyline and back drop of the Capitol city looming overhead. Bicentennial Park was filled with cranks who cheered their teams in the heat of the day. Many new spectators fell in love with our brand of base ball after watching a great match. The game started out with both teams sizing each other up and trying to figure out how to tally some aces. Mountain City won the bat toss and elected to be home club. Phoenix was held scoreless and the willows of MC began to warm up. MC scored 3 aces in the 1st and 2 aces in the second. MC squeaked 3 more aces in during the 5th. The score was 8-0 MC in the bottom of the 5th. It was the 6th inning that allowed MC to gain a sizable lead against the fine gents of Phoenix. Mountain City pounded the onion and rang the bell 10 times in the 6th, putting the score at 18-0. MC would not touch the dish again the rest of the match, however Phoenix scored 2 aces in the 8th after some beautiful strikes into the trees of right center. The final score was 18-2. Offensively for Mountain City, Shiner and Cowbell led the way going 4-4! Taco was 3-3, and Sweet Feet and Britches went 3-5 and 3-4 respectively. The MC defense was the real story. In two combined matches, 18 innings played, the MC defense has caused 15 scoreless innings by its opponents. Of those 15 shut out innings, 14 were consecutive. The MC defense has allowed a total of 5 aces in two games, while putting up 29 aces at the dish. Britches got the game ball for great striking, base running, and fielding amongst the trees in right field. It was a beautiful day for the start of the vintage base ball season. The sun was high and bright with clear skies, giving promise of warm days ahead. There was still a bite in the cool spring air with a game time temperature of 52 degrees. 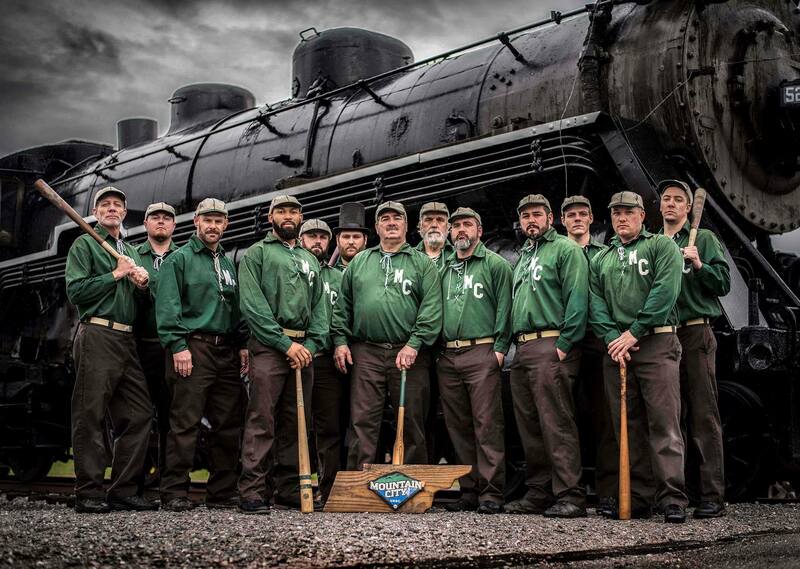 MountainCityVBBC won the bat toss and took their defensive positions. The big willows of the Holstons showed up in the first inning and tallied two aces. MC then took to the dish and somehow managed to score 5 aces in the bottom of the first. Both teams showed some rust and first match jitters. For MC, Taco in left field, Sweet Feet in center, and Mighty Bandit at short stop continuously made great defensive plays. Including a beautiful 6/3 double play by Bandit and Cowbell. At the dish, Taco, Bandit, Pepper and Sweet Feet all had a great showing. MC was able to slip in a few more aces later in the match for a final score of 11-3 in favor of the Mountain City club. Taco was awarded the game ball.